Weakness always begets aggression, and, like clockwork, Obama’s repeated signals that he is weakening America’s commitment to Israel are emboldening the Jewish state’s enemies. From Syria to Iran to Lebanon, from Hezbollah to Hamas and the PLO, the wolves smell blood and are trying to gauge whether they can get close enough for the kill. And whether the United States will stop them. That they even dare hope we won’t reflects the danger of Obama’s demented decisions. The huge flotilla is the latest example of the open-season mania, with the result that Israel is under international siege — for defending itself. And, not incidentally, for defending an embargo on Gaza that Washington supports. This whole situation makes me so mad, it’s indescribable. Fortunately, the country seems to be coming around. Haven’t said much about the latest Middle East conflict between Israeli and Hamas…and here’s why: I know how it’s going to end. It’s going to end like all the others. Israeli is going to bomb Hamas to within an inch of their lives. At that time, world diplomats (and at this point Barack Obama) will step in and broker a deal that “stops the bloodshed” which Israel’s Kadima idiots will sign on to. Peace in our time! Long live diplomacy! 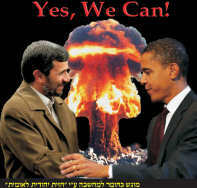 Hamas will then be able to regroup and rebuild with Iranian money and the process begins anew. Simple. Easy. What more is there to say? EVEN MORE: It’s a whole new world…the IDF starts its own YouTube Channel. Wonder how long before YouTube gets cold feet and pulls it? Meanwhile, news from the real civil war in the Middle East.